Something you ould never buy to ride. Heavy, totally over-engineered, ridiculous, expensive. But a must have for a collector. 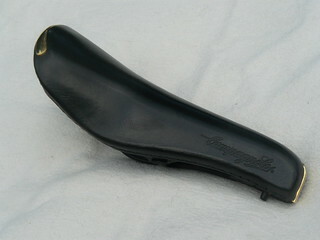 So, here it is: Campagnolo Electa pneumatic saddle. Complete with box, bag, pump and instruction leaflet. Not even developped by Campagnolo. 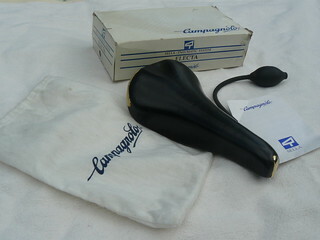 The technology and manufacturing is by Fugazzi (check: Air Dea saddle), but of course, the Campagnolo logo makes it really hot and desirable, although a Fugazzi is even more rare. The bladder, which can be maintained and even replaced (but where the hell would you find spares?) 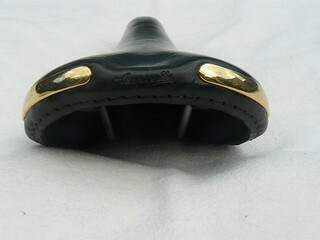 when the leather cover is removed, can be inflated with a dedicated pump to a very low pressure of 0.4 - 1.2 bar, which equals 4 to 8 time squeezing the "inflator". This depends on the rider's weight and preference.